When the infotainment system was first introduced to the market, it was revolutionary. Unfortunately, car manufacturers are not known for great user interfaces for their software. Users were stuck with it, though, and so the cumbersome menus were tolerated as the nature of the multimedia beast. With the growing popularity of the smartphone and Android based mobile devices, auto manufacturers and Android developers have understood that there is a demand to produce software that not only re-designs the infotainment system, but also works alongside the already popular Google platform. Android Auto provides such a solution. Before jumping on the Android Auto bandwagon, let’s take a look at how it works and who it will benefit most. What exactly is the Android Auto system? Android Auto is a USB based app for your vehicle’s infotainment system which allows the user to have better integration between the functions of the stereo and the common tasks of their Android device. When in use, the phone cannot be used, rather the functionality of the phone is transferred (in part) to the infotainment system. The user is then given the option to access navigation, phone, and messaging options, information, music, or vehicle diagnostics. Within each menu are sub menus, but far less than the average infotainment system. One of the most notable benefits of the Android Auto system is its integration with Google apps. This means that the navigation buttons are large and recognizable, that the notifications are very similar to those which you would see on a standard mobile or tablet device, and that certain features (such as the GPS) are google based. Users who are familiar with the Google apps which encompass everything from YouTube to Google Maps should be comfortable in using the system. In addition to the Google integration, the overall design of the Android system proves to be easier to manage than the built in media players most car manufactures provide. Using a card based tile system, Android Auto shows information such as weather conditions, recent searches, and important notifications in a visual way that works at-a-glance, which is a key necessity while driving. According to arstechnica, “despite Android Auto being contained entirely within apps and not “built into” the operating system, so Android Auto requires Lollipop, the latest iteration of Android. The biggest reason is that Lollipop added a ton of APIs that make Android Auto possible.” In other words, the android device which is being used must be compatible with Android’s latest operating system and the device must have the appropriate apps, or else it won’t work at all. This is a cumbersome for the person that just wants to listen to their favourite playlist while driving. In addition to the apps, there is the costs to consider. Google Play all access is not free (though you can get a free trial) and so the user of the system is apt to run up a bill. If using Google Play with the Android Auto system, it is advised to get an all access monthly pass rather than a pay as you go method. There are other small things, like voice commands being a bit slow and that apps can work intermittently where cell reception is not very good (A key issue for Vancouver Island and parts of the Mainland). However, these negatives are across the board, not just with Android Auto. Android Auto is best suited for the person who is already using an Android device. While the system does restrict the usability of mobile functions (meaning you cannot check Facebook, Twitter, or your email) it does provide you with the essentials that you need while driving. 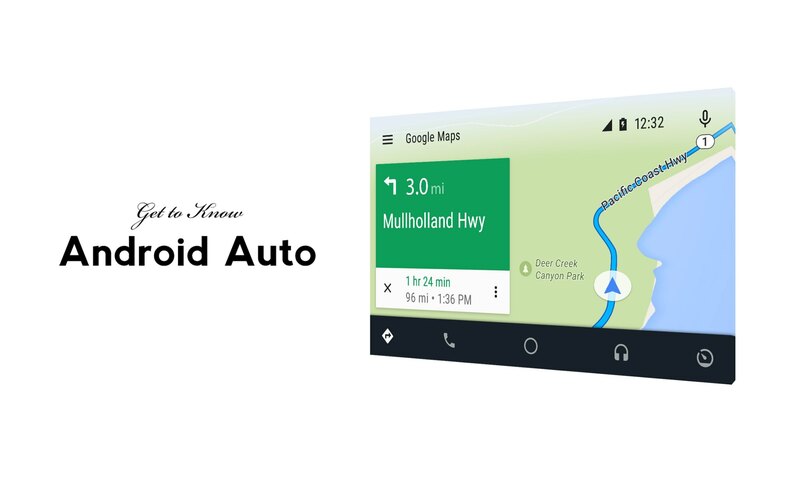 The Android Auto is ideal for those users which are already familiar with Google Maps and the rest of their suite of free applications. If you would like to simplify the navigational system, this might be the biggest benefit. Everyone is familiar with Google Maps for directions and point of interests, surely, and having this application in your vehicle can you save you the time of learning a proprietary GPS from your vehicle manufacturer. Users of Apple’s iOS are not good candidates, as there is no cross compatibility. For them, Apple CarPlay is the way to go, and we will look into that next week. If you hate clutter, it might be worth waiting for the wireless iteration of Android Auto, since you will need to run a cord from your dashboard to your phone to get it all connected. Wireless is in the works, so it will be a welcome addition for those of us who avoid distraction and want a more seamless experience.